Buy the physical book and receive the ebook version at no extra cost! PLUS Free Shipping to anywhere in the world!! Would you like to successfully accelerate the speed of your career progression, but aren’t sure how to do it? The fact is, there are tangible skills and practices that that will progress your career – providing you master those practices. If you’re in the first ten years of your career you must discover and master the skills and practices that will create the career you desire. What Really Matters For Young Professionals is a timely, easy to read and extremely practical book full of tips and strategies for young people. 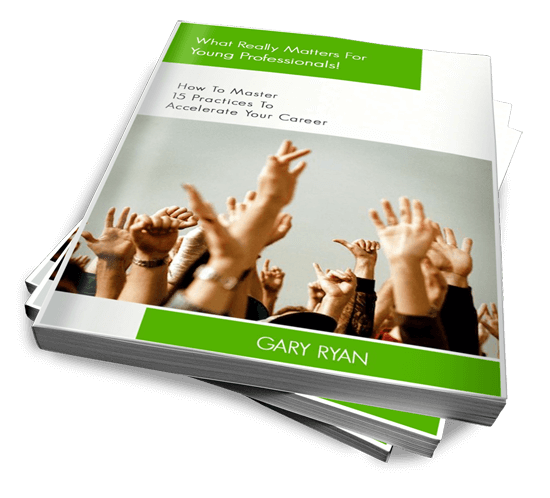 Gary Ryan has compiled a must-read blueprint for anyone under 30 who is looking to truly accelerate their career in this competitive age. Imagine if you had a simple 15 point checklist of the skills and practices that, when mastered, would accelerate the speed of your career progression … for example knowing how to capture stories that reflect the employability skills that you have mastered, having a deep and clear understanding of your personal values, knowing how, in practice your personal values align with your organisation’s values, knowing how to stop yourself from jumping to conclusions and better managing your internal workplace communication…and much, much more. That’s what this book will teach you. Wow! This book is jam packed with useful and practical strategies for young professionals wanting to take the next step up in their careers. In a time where young professionals are constantly asking for more mentoring and training, this book is the perfect do-it-yourself manual to improve your employability. What’s so great about accelerating the progress of your career? Establish a reputation for high quality execution – nothing accelerates your career faster! On a personal note I have to say that mastering these skills and practices have had a massive impact on my career and they have enabled me to live the lifestyle I desire. And I want to share these simple yet effective practices with you and I think you’ll discover just how powerful they are too, especially when all 15 practices are being executed simultaneously. This book is the definitive tool for young professionals with loads of expert knowledge who need to quickly develop high-level employability skills. It can also be used by managers and HR professionals for induction of their graduate recruits, or young at heart professionals willing to adjust to the contemporary workplace. If you want to succeed in the 21st century as a high-performing individual I recommend you read this book. Here’s a sneak peak of some of the questions that are answered in What Really Matters For Young Professionals! How do I capture stories that reflect the development and progression of my employability skills? How do I discover my personal values? How do I stop myself from jumping to conclusions and causing all sorts of trouble for myself and others? Why should I have mentors? How should I best communicate important messages? What are some tactics that I can use to better master my time management? 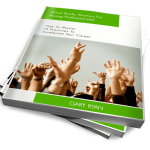 Gary Ryan has written a book which caters for those of us who are lifelong learners and hungry for self improvement. Gary has a straightforward philosophy, intermingled with stories from his own life and theoretical underpinnings, that we are ultimately responsible to demonstrate leadership traits, irrespective of the positions we hold in our careers and with our families. That sample chapter is one of my favourite – and most useful – chapters in the book, because it shows you how important it is to have mentors in your life, and how to go about finding and recruiting them. And this is not like any other product on career progression. Why? Because I’ve been there and done that. I know what works and what doesn’t work. I’ve had extraordinary success in progressing my own career from being a labourer, a cleaner, to a gymnasium manager, to a teacher, to a senior executive to an entrepreneur and a sought after facilitator, educator, mentor, coach, speaker, company director and, of course, author! And more importantly, I’ve helped thousands of people develop the various practices identified in this book. Since 1994 I been mastering my own skills in both developing myself and those people with whom I worked. My first serious job was as a manager, mostly of people much older than myself. At the young age of 24 I had to quickly learn how to the people who reported to me to be the best that they could be and I am proud to say that all those people have taken their careers in the direction they desired. To have balance in our lives. The 15 practices that I have selected have been chosen for these very reasons. Once mastered these practices will enable you to have the career success and life balance that you desire. My 16 years of personal and professional development experience has enabled me to master how to both design and facilitate workshops. I am able to take relevant theory and turn it into usable and practical steps to enable people from all cultures to master the skills necessary for success. So what I’m saying is I’m sharing all this real-life experience with you. Which means there is no fluff. Just the answers you want to know. This really is a short cut to accelerating your career. What is a resource like this worth? 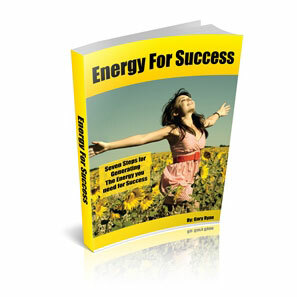 Mastering the practices outlined in this book have seen me multiply my income many times over. More importantly they have enabled me to live the life I desire. I want you to be able to do that too. Of course I can’t guarantee how much you will accelerate your career, because it really does depend on how serious you are about mastering these practices.